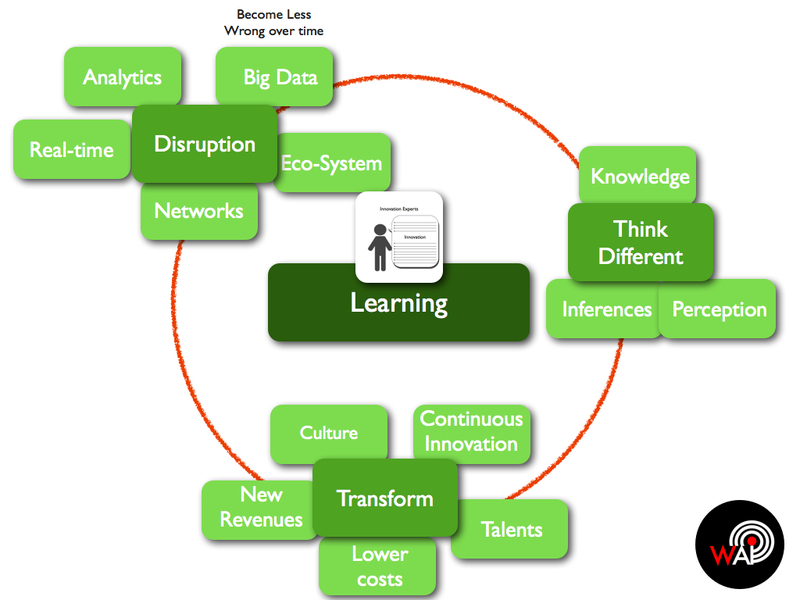 InnoTrends is an innovation trends analysis for each innovation segment. 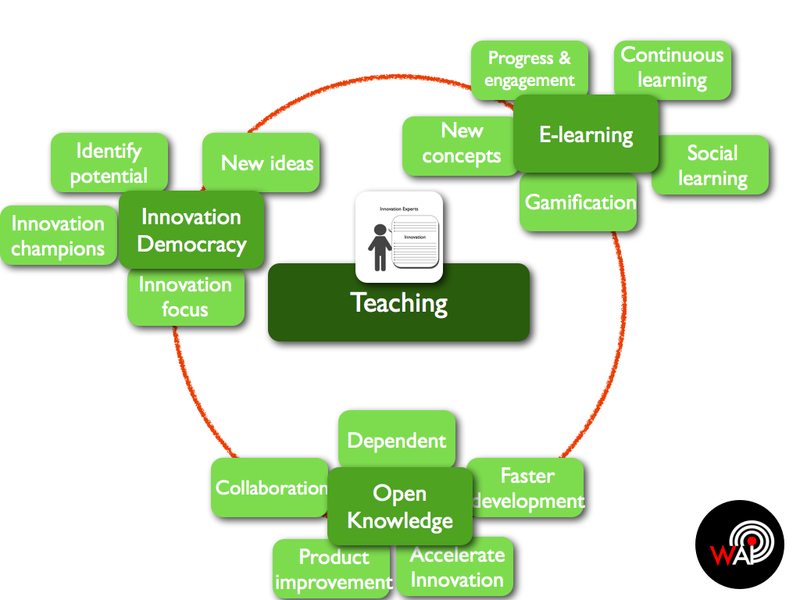 Today we look at how Innovation Experts develop a “transformative innovation” concept. To Manage for Disruption: “The new age of disruption requires a big data mindset, where we’re not trying to be right, but to become less wrong over time by collecting and analyzing real world information in real time and adjusting accordingly.” From the way we analyse markets to the way we respond to them, Big Data is changing approaches, tools, therefore we need the cultures to drive and skills to analyse data. In his article for Innovation Excellence, Greg Satell reminds the importance of building ecosystems to collaborate with external creativity and skills, with the use of APIs for example, as well as the importance of internal network to foster ideas. To Transform for long term: “Successfully building a strong culture of continuous innovation also represents a huge opportunity for an organization to attract the best talent, to lower costs, to continuously add new revenue streams, and to better achieve competitive separation.” Braden Kelley from Innovation Excellence is deeply attached to growing organisation that strive for innovation, and explains in this article how to engage a global organisation into building change. 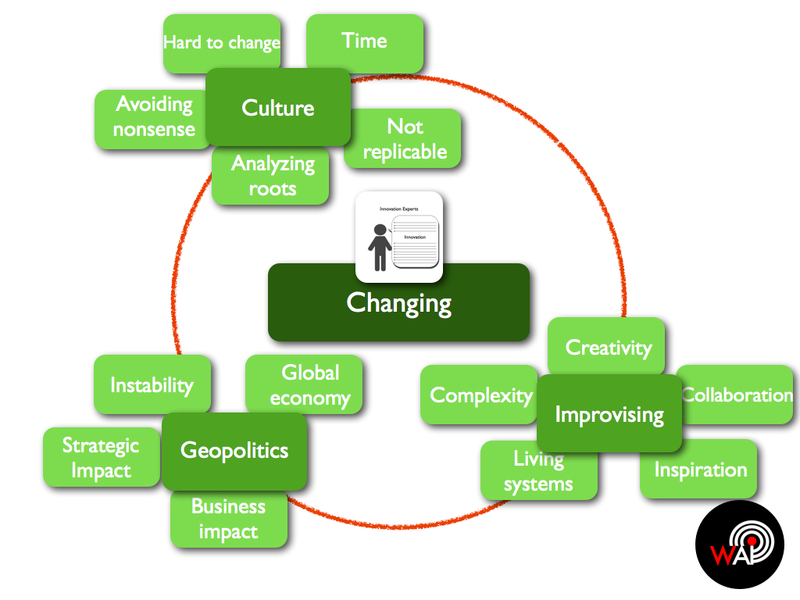 From senior management to processes, the key word is: “Change needs to be managed”. To Think differently: “Solving a problem requires three actions: (a) we perceive data or information, (b) we bring forward relevant knowledge from our long-term memory into our short-term memory, and (c) we draw inferences about what is going on in order to choose an action or to seek additional data. Since we draw inferences only from what is in our short-term memory, our ability to solve problems is limited by our capacity to hold information there.” Jorge Barba tells us on Game Changer what are the key cognitive limits we need to overcome to think differently. It starts with identifying value in different thinking models and leads to thinking more creatively, beyond our short-term memory limits. Being Self Reflective: According to Bruce Nussbaum from FastCompany, being self reflective helps to find the space and time needed to integrate knowledge, which we lack in our hyper-connected world. He advises that we become “walkers” like Steve Jobs, being mindful of the roots of our knowledge, understanding historical context and relationships to become more creative. “Knowing and being able to explain it, with wise and fresh eyes”. 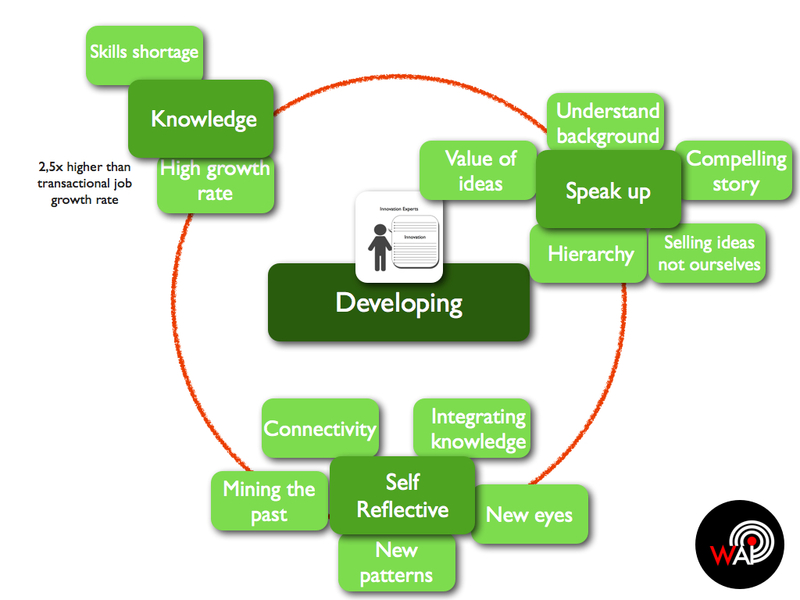 Knowledge workers: “‘Knowledge’ jobs will be the most difficult positions to fill and the most in demand. Currently, it’s estimated that these are growing at a rate two and a half times faster than transactional jobs, which demand fewer conceptual duties.” Kerry Butters, from Elcom Blog, explains how companies that foster knowledge will eventually win over others. Vertically and Laterally: In order to better communicate to your audiences, “It is important to understand what they are thinking about, what their considerations are, and why. Good ideas can be derailed simply because they weren’t compellingly communicated. How do you translate the value of an idea, product, or service as it moves up the organizational hierarchy?” In following article, Innovation Coach explains how being concise, selling our ideas and not ourselves not being afraid to speak plainly even to CEOs. Story Telling: “Connect with the person not the job title – talk about real human emotions”, says Caroline Florence on ExploreB2B. She explains how understanding tensions of conflicts in any situation, using metaphors and analogies to reiterate ideas, taking risk up to appear vulnerable helps to connect to others and develop sharing stories with humans rather than managers. 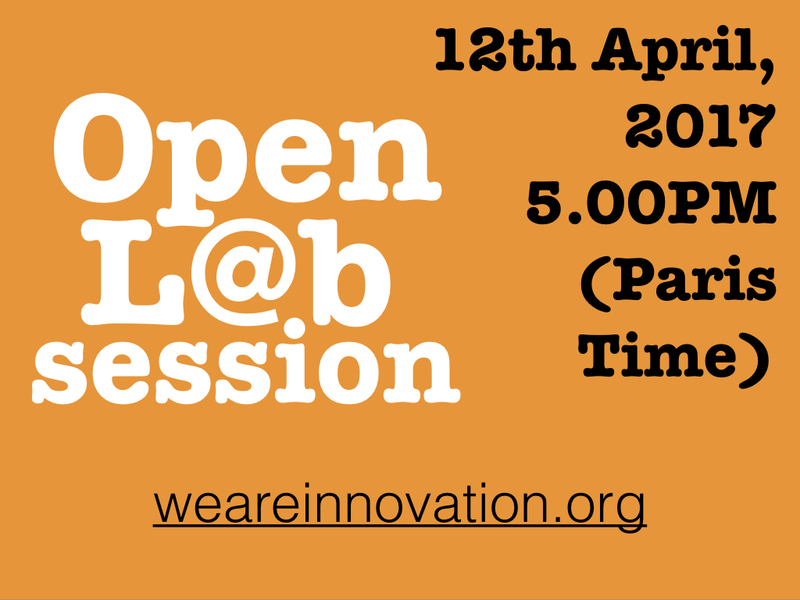 Open Innovation: “even though some creative consumers might initially signify a black hole for future revenue because they breach copyright and intellectual property, they also represent a gold mine of ideas and business opportunities.” Ian McCarthy from It Depends takes us through the imperative investments in customer engagement and participation to develop products, even though they may be a complex strategic asset to manage. Including loyal and creative customers in the value-chain benefits on the long term and concentrates effort on satisfying overall customer satisfaction. Crowd Sourcing: “Crowdsourcing mapping data has become standard practice, and something companies — including Apple — do to come up with real-time traffic data”. According to MapCite, Apple is to call on business customers to provide updated information for their new map service, Apple Maps Connect. It is secured by a map code and PIN code linked to business mobile phone number. The writer reminds that Apple already sources map information from partners such as TomTom or Digital Globe. The innovation democracy: “Managers need to believe in innovation democracy, ideas with a billion dollar potential can come from anyone and anywhere. They need to accept their pivotal role as innovation champions”, as reminds Braden Kelley for Innovation Excellence. He claims that business schools and companies sometimes create more business administrators than innovators. To avoid this trap, we need to let ideas grow from any side of the company and build processes that invest and develop them so many voices can chart the future of the company. Managers should also be more focused on innovation. From E-learning to Gamification: “It makes it easier to foster knowledge workers, and to promote within the organisation. Training managers can easily keep an eye on the progress of each employee, how engaged they are with learning, how quickly they grasp new concepts and more”, says Kerry Butters from Elcom Blog. New technologies have developed a range of creative learning tools that can improve knowledge sharing, from blended learning, social learning and gamification to continuous learning. Open Knowledge: “We are not self made, we are dependent on one another and creativity comes from copying, transforming, and combining to improve. And also innovation. Collaborating with others, whether they are competitors, suppliers or partners can lead to faster new developments”. The Blend Hub explains how opening knowledge contained in formulation of agrifood products would help improve products, bring more value and accelerate innovation in the sector. Geopolitics: “While they have been mostly bullish about the global economy since December 2013, executives are far less optimistic now. Only 39 percent expect global economic conditions will improve in the next six months, compared with 59 percent in our June survey. What’s more, 80 percent of respondents now believe geopolitical instability in the Middle East and North Africa is very likely or extremely likely to shock the global economy in the coming year, the largest share since 74 percent said the same in September 2013”. As McKinsey explains, change in geopolitics and global economics affect more deeply business owners and C-Level concerns about their strategy and market potential. Although difference remains in geopolitics impact between Europe and emerging economies, the global economy and geopolitical influence on companies is changing the way we drive business. Culture: “We’d love to just take a blueprint from another company and apply that to ours. But culture is something you need to work hard on, something that takes years of learning and improving to bring about, and it requires continuous nurturing to stay healthy”. Mathias Meyer from paperplans.de uses a company case to detail the difficulties and misunderstandings that occur when we try to simply copy and paste cultures without analysing the core roots of failures and successes for each companies. Not making sense eventually leads to nonsense. “You simply can’t replicate cultures”, concludes the author. Creatively and Collaboratively : “As we recognize ourselves and our organizations as living systems, we see that these moments of improvisational flow aren’t magic. They’re our birthright. They’re the way we’re wired to operate. But we’ve lost the ready capability to tap into that mode of operation. In fact, the reality is that we have no choice but to develop our ability to improvise.” Most companies seem to avoid the idea of improvisation by developing sophisticated ways to control a business and a company, but Michelle Holliday from Solarium thinks it shouldn’t be so. She explains how the complexity of today’s world urges us to think creatively and collaboratively, improvisation being one of the most natural human source that could inspire change. Previous Post Education is the key to everything, says Georges Sand.